Within Van Tol Food Concepts we develop brands, concepts and product designs for various countries, target groups and markets. We take opportunities, needs and trends of the specific target market as a starting point. All this allow us to create a vision which is the base of the positioning, packaging design and product selection for the new product and/or brand. EMHA and Daily Dutch are two beautiful brands which we have developed according to our vision for selected export markets. 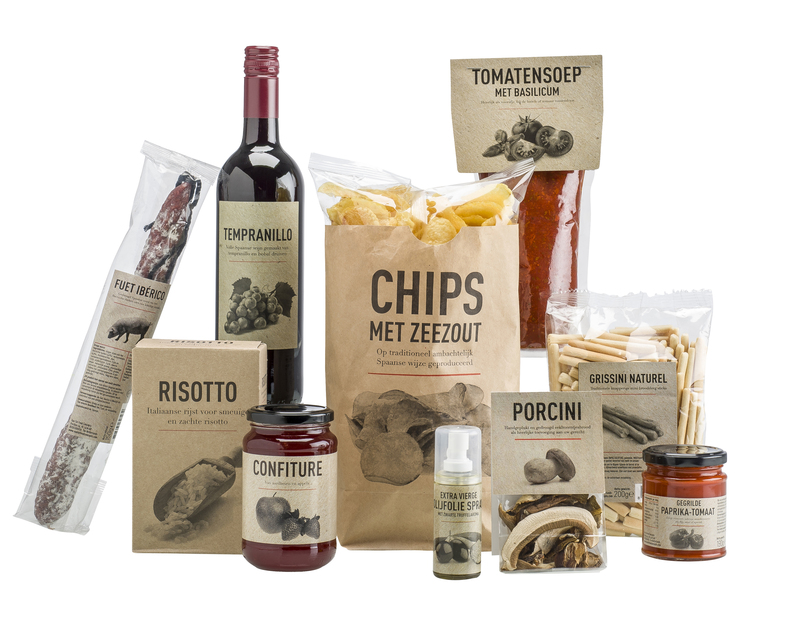 For the Dutch market we have developed the brands Het Goede Leven, Selezione Mediterraneo, Kerstgoud, Bake & Cook and Kraft. These are just a few examples of what we are able to develop. As within Van Tol Food Concepts our focus is not only on our own brands, we can do this for you as well. 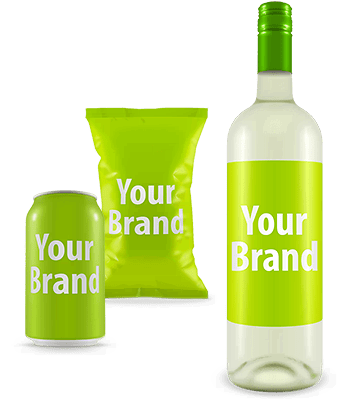 Whether it is creating specific packaging, brand development or brainstorm with you about a whole new concept; we are up for the challenge to conquer this together with you. Many customers have preceded you. For instance we have created a unique biscuit concept together with an Australian customer and another example is ‘Goisco’; an applesauce product brand developed with a partner for the Dutch Antilles. No matter the products or market, adding value for you as well as for the consumer, is our main focus. EMHA is a quality private label with a wide variety on food cupboard products. 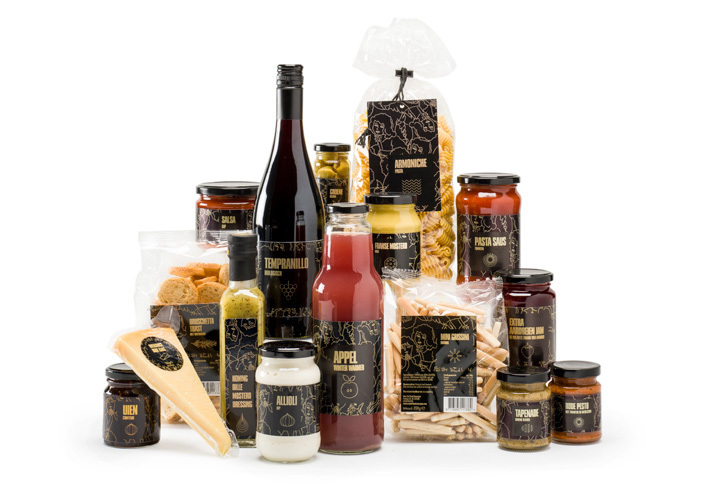 From canned products to pasta and from biscuits to bread toppings, all can be found within this range. The wide variety of the range, the clear communication on the packaging and its appealing, yet basic, design make EMHA an excellent brand with added value within your store (formula). The carefully selected products and the choice of reliable, experienced Western European partner manufacturers make EMHA a brand with excellent quality products at a good price. Daily Dutch is a premium brand of high quality dairy products. The brand shows reliability and sustainability. The design is playful, focussing on trust by the consumers and is very appealing to families, and more over, children. The range currently consists of a variety of UHT milks, cheese spreads, real butter and cheeses. Products of which we are convinced bringing you close to the Good Life, which is what Het Goede Leven means when translated from Dutch to English.Beautiful scenery, nice weather, peace and tranquillity; all associations that come to mind when thinking of the Mediterranean landscape. We are missing one important factor though: delicious food! With the product line of ‘Het Goede Leven’ we expect not only to supply the latter, by experiencing the food we take the consumer (back) to this beautiful region. With the wide variety of delicatessen, whether it is part of breakfast, lunch, dinner or afternoon snack, this range allows excellent use for gift baskets. 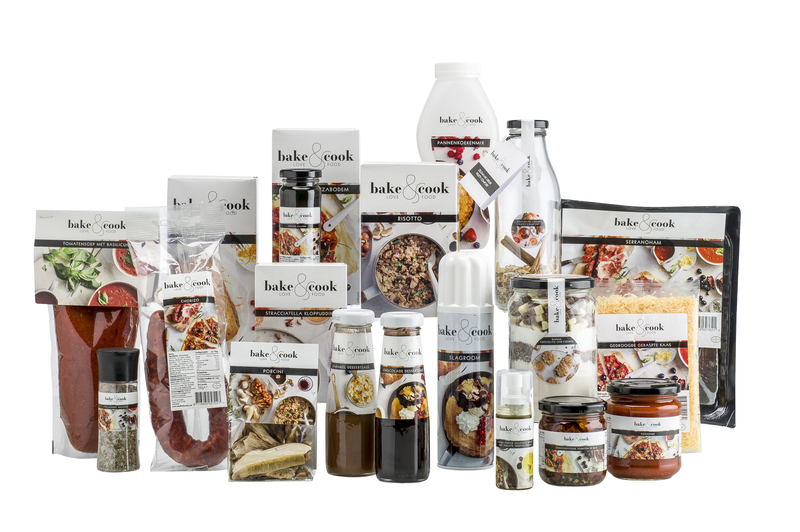 With care selected Mediterranean products. We explore daily regional products with an unique taste and high quality. It is our passion to share these treasures with others. 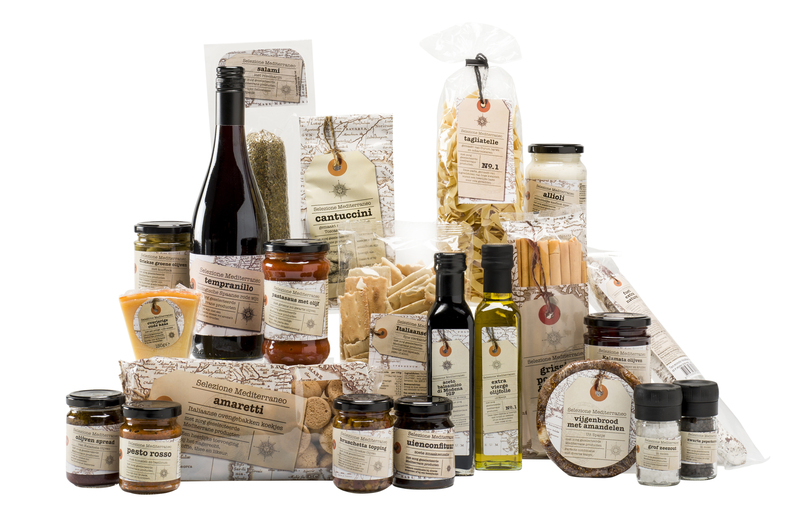 Deliciously marinated olives and spreads from Greece, charcuterie from Spain and Italian biscuits according authentic recipe. 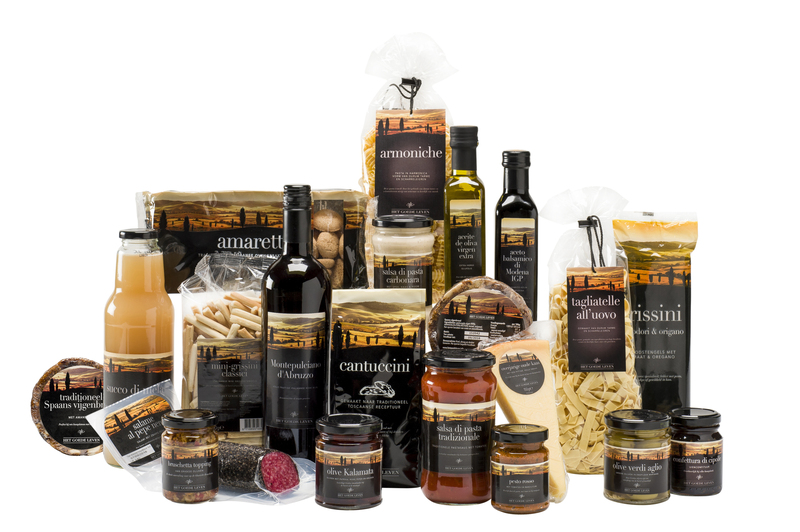 All these treasures are included in our line ‘Selezione Mediterraneo’. Do you take your consumer on a journey? Christmas with an golden edge. Black and gold; two colours traditionally linked to Christmas. The product related pictograms under the product name, the modern letter font and the colour tones offer the modern look and feel. Apply this product to popular products for instance on cheese platter, snack platters and the Italian meal and the base for a nice gift basked is created. Nice food, we cannot get enough of it! Fresh, quick and healthy; the highest priorities for consumers on selecting the largest part of their daily groceries. On the other side we see that home baking and cooking at moments where there is more time and occasions to it gains popularity too. The food blogs and recipe websites are growing in both quantity as well as quality. People love to be inspired and to recreate it in the kitchen. Because honestly, what is more fun than creating your own pizza, cookies or liquor and sharing it with others? Bake & Cook is the perfect base for a delicious treat to yourself or to share with others. Our products inspire for your own unique creation. High quality products: strong in their simplicity and originating from craftsmanship and passion. The products under this brand are pure and simple. Simple in the best meaning of the word; one ingredient or a small amount of ingredients, made by people with passion, knowledge and experience for the final product. The paper-look of this packaging enhances this vision and allows multiple combinations in many gift boxes. Boost your retail image while increasing your profit margin: distinguish your outlet from the competition and increase store loyalty by offering customers an exclusive product. Control how much profit goes to marketing, so you can choose to pass the savings on to consumers, or position your private brand as a premium product. A private label perfectly suited to local customer demands: not only does our existing selection offer you a wide range of quality products to choose from, but we can also source a specific product for you. We can even discuss adjustments in recipes with the manufacturers, so you have everything to make your label truly stand out. Within the Dutch and Belgian markets we are active players in the supply of Christmas hampers. We do so from the Van Tol Food Concepts department as the development of our own brands and market specific solutions are a major part of our activities. We are continuously sourcing delicious products with the right look and feel; products, themes and packaging which, together with other items as part of a harmonious selected Christmas hamper, make people happy. This is the charm of the business in which we operate and which motivates us on a daily basis to be innovative, original and passionate.In addition to our own brands, we also represent Unilever, the KraftHeinz Company and Jacobs Douwe Egberts brands within the Christmas hampers industry.